Next up in our coverage of the Io abstracts submitted for next month's Lunar and Planetary Science Conference is "Ground-based Observations of Io in Support of the New Horizons Flyby" by Julie Rathbun and John Spencer. The authors examine data they acquired at the Infrared Telescope Facility (IRTF) in late 2006 through mid-2007 as part of a campaign to take complimentary data with the New Horizons spacecraft. Rathbun and Spencer acquired observations during 21 night between August 2006 and June 2007. These observations consisted of sunlit images, like the one at right acquired in November 1999, eclipse observations (see the post right below this one for similar observations taken in 2000 by Cassini), and occultation lightcurves. Data from these nights were taken in the near infrared at 2.2, 3.5, and 4.8 microns, which can be useful for look for thermal emission as well as measure color temperatures (though with a low-end wavelength of 2.2 microns, it would miss the hottest components). For the sun-lit observations, both reflected sunlight and thermal emission were observed, but these images were useful for expanding longitude coverage. Super-resolution processing of this data also improved the spatial resolution of the sunlit data. 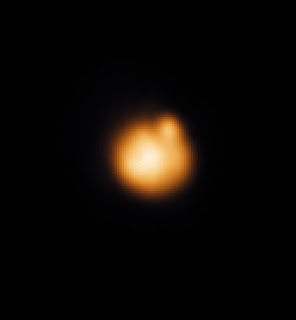 Rathbun and Spencer found a hotspot at Tvashtar, showing that the eruption there so vividly seen by New Horizons was ongoing as far back as January 18, 2007 (Tvashtar had been known to be active as early as mid-February 2007 based on HST data). The eclipse and occultation curve observations have the benefit of excluding the contribution of reflected sunlight, but they are limited to the pro-jovian hemisphere. Even so, several additional active volcanoes were detected, such as Masubi, Kanehekili, and Dazhbog (perhaps east Dazhbog, a surface change seen by New Horizons). Occultation curves are disk-integrated brightness measurements taken as Jupiter passes between Io and the observer. As more and more of Io is covered by Io (or less and less in the case where Io is passing from behind Jupiter), thermal emission from individual volcanoes blink out (or blink in depending on whether you are looking at ingress or egress), which appears as a "step" in the disappearance/reappearance light curve. With accurate knowledge of the position of Jupiter and Io at the time of those steps, the location of Jupiter's limb at the time of that step can be plotted as a line on a map of Io. The active volcano making that "step" should then be on that line. Having both reapparance and disappearance light curves can further improve hotspot identification because the respective mapped curves should cross at the position of the active volcano. Rathbun and Spencer don't seem to have performed that analysis (or they don't have both disappearance and reappearance light curves from the same occultation). By extending our knowledge of Io's active volcanism during the New Horizons epoch in time, we can place New Horizons results in better context. For example, we can tell that the Tvashtar eruption NH observed have been going on for a month and a half by the time the spacecraft observe the large plume there. The authors hope to compile similar data for the three volcanoes identified in the occultation curves and eclipse data and see how activity at those volcanoes varied during the New Horizons epoch.